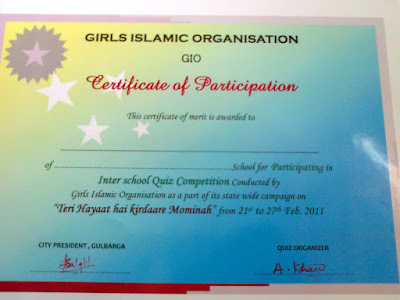 As part of thier state wide campaign on "Teri Hayat Hai Kirdar e Momina" (Your life is an example of a beleiver) the Gulbarg unit of Girls Islamic Organization organized a Quiz Competition for girl students of High Schools on 24th February 2011 at National High School. 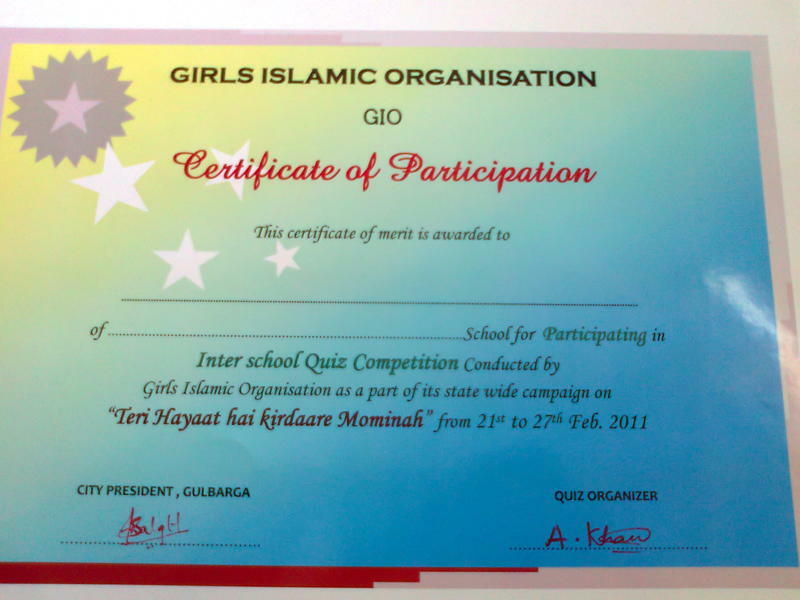 Students from nine schools participated in the competition. 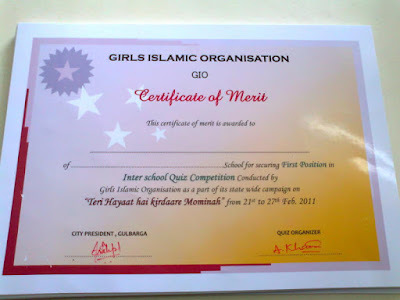 Each school was represented by three students. 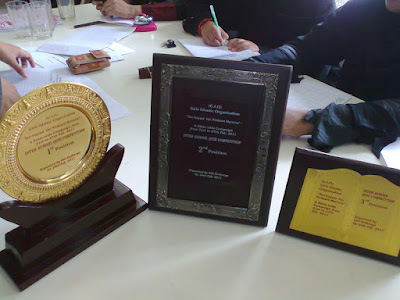 The Quiz based on the biographies of six women companions of prophet Mohammed PBUH Harat Fatima(R), Hazrat Zainab (R), Hazrat Khadija (R), Hazrat Aayesha (R), Hazrat Hafsa (R) and Hazrat Bi Bi Mariam (R) was conducted in five rounds after each round 1-2 teames were eleiminated. 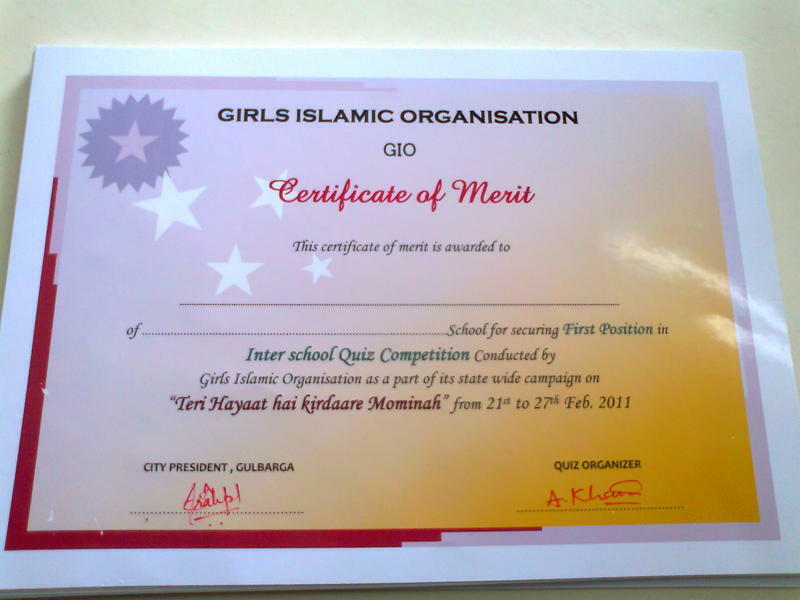 First round comprised of asking three quetioins to each team where as in the second round a written objective test was taken. The third round called "tol mol ke bol" in which there were negative marks. The fouth round called 'harkat men barkat" in which participants were expected to enact the theme given and their team mates to identify the action. The final round comprided of two sessions of rapid fire quetions. You have made a wonderful, beautiful shield there. It reflects on the care and attention with which the whole programme was conducted. Alhumdulillah.